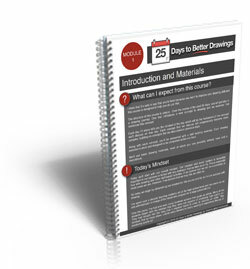 Description: An introduction to "25 Days to Better Drawings" and a look at the materials that will be used throughout the course. Day 1 was great. Finished the picture. Looks okay. Day one was a disaster. I tried and tried to use photo reference with no success. Folds would not work for me and the cap was impossible even when I tried to just look for basic shape. Hi Gail, Don’t be discouraged. Day one is meant to set your starting point. Your work will improve as you go through each day. I had the same problem! My mindset must be really off! I also tried the demo, and just put it away, will move onto lesson 2. Love the way you do your lessons Matt. I have improved a lot under your tutelage… and still miles to go. Happy with my paint tube but took a while! Thanks for all the courses. I have learned so much. Brandy, I know how you feel about being a perfectionist. I keep telling myself to simply get better than I did yesterday, not aim for perfection. That usually helps me move forward. I found this a very challenging drawing to do, and I couldn’t complete it in the hour. I am struggling with the tonal values and proportions. Trying to figure out the shading and then the placement of the lettering! Wow, very overwhelming. But I am here to learn so I will press on! Shading a problem you can tell it is a crumbled tube but i sure i am missing some highlights. Just finished Day 1. Drew from a photo I took at the Taos Pueblo last October. I’m left handed so the graphite smears. What can I put under my hand that won’t affect the graphite? May try a kleenex. I usually use a sheet of layout paper. It’s not so much a cases of handed ness though, as simply a consequence of resting your hand on the paper – right handlers often have the same issue. Do you have an Amazon account, Nathaniel? I get most of my supplies there. Look at DickBlick.com. That is where I purchase all my supplies. Well that was a humbling experience! I can draw, but I’m rusty and I do have difficulty with seeing values, let alone drawing them accurately. It’s made me think I need to go and review some basics before I try improving, but we’ll see how I get on tomorrow. I thoropughly enjoyed the course. i cannot download the book for day 1. i have tried several times. can you help? You could try right-clicking on the link and choose the “save link as” option. Challenging, but fun. It’s better than I’d have thought but is a far cry from the original. I get captivated doing it which I love. 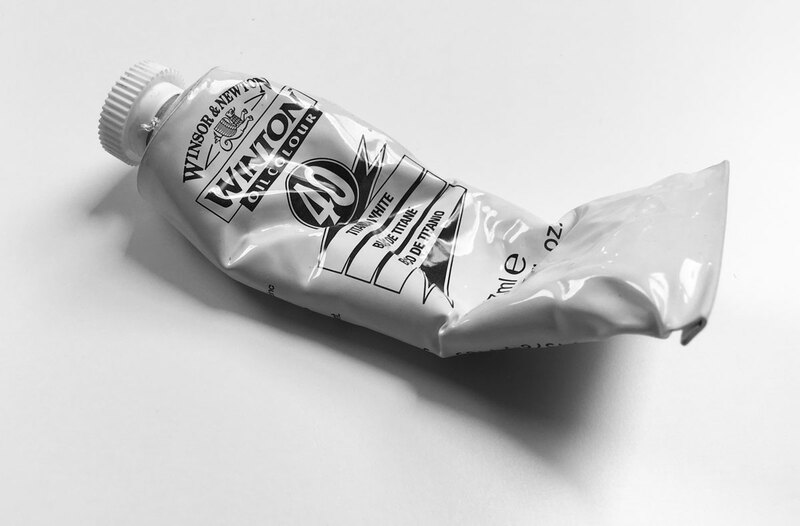 Okay, for a “small slightly complex object” – I chose your photo reference, the scrunched paint tube. The overall shape was fun, but the shading – frustratingly challenging! How do you get shiny white out of graphite?? No pressure here. This is just to establish a starting point. 🙂 The light highlights on the paint tube should be created by allowing white of the paper to show through in areas. Is this what you are asking? Did day 1 using paint tube. I’m looking forward to the rest of the course. I also did the drawing of the Tube (Photo reference). That was really challenging. I left out the writing, as that would have eben really distracting. But I really liked. Can‘t wait to move on and look back in 25 days. good learning experience overall, spotting the values for folds and shadows. I struggled a bit with angles and letter size for the print on the tube. So the tube looks ok but the print on it is unfinished for me after an hour.